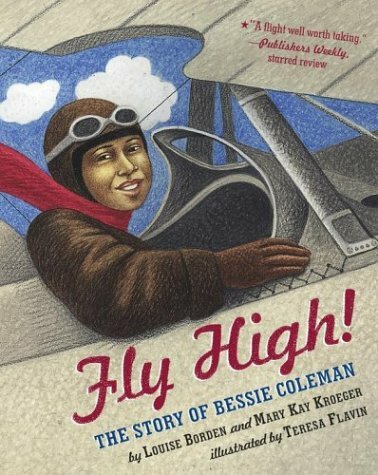 Learn more about Bessie Coleman! This is an inspiring story about Bessie Coleman who became the first African-American to earn a pilot's license. Knowing there was little to no opportunity for her in Texas she sets out for Chicago. It is there she is determined to become a pilot but no one in the states will teach her because she is African American. She learns that she can get the training she needs in France. She works endlessly to save the money to go overseas. Not only does she do this, but also learns French in order to take the pilots test. On June 15, 1921 she gets her international license to fly. It is very interesting to note how much more difficult it was for Bessie Coleman to get her pilot's license than any other American. She faced two enormous barriers in Chicago that she had to overcome. Not only was she a woman, but she was also African-American, both of which made it very difficult, if not impossible for her to get her license in the male white dominated pilot schools in the 1920's. No one wanted teach her how to fly because it did not conform with the current accepted beliefs. She realized that it would be virtually impossible for her to accomplish this. Without her dedication and perseverance to overcome the accepted norms of the time, she would have never been able to accomplish her dreams. It is important to tell her story and stories like hers in order to help students become aware of the struggles women, African-Americans, and people who are different often face when trying to achieve their dreams. Young students need to understand that women, minorities and people who are socially different still encounter challenges, glass ceilings and persecution, even in 2016. This is a great story to read to students. For a classroom activity students can write a journal entry from the 1st person perspective and cite details from the story. Then the class can be put into groups illustrating a time frame in Bessie's life. The class then can combine their illustrations to make a time line of her life and put it up for display.